I just want to take a moment here to alert you of a guide that should be really helpful in working skill moves into your game. Skill moves can improve your offensive game and we all know how cool it is to do a 360 roulette around your opponent. However, skill moves are quite difficult to get the hang of and then work into your game. The Premier FIFA 13 Guide had a lot of incredible tips that helped me work skill moves into my game. Want proof, check out this video I made a while ago showing off my skills! Again, the Premier FIFA 13 Guide is what I used to help me get that good at skill moves. Below is a table of all the possible skill moves in FIFA 13. Remember that pretty much every skill move requires for the left trigger to be held down, without it your player will just dribble normally if you are moving the right stick. These controls are the same for both the Xbox and the Playstation, although on the Playstation the trigger you want to use is L2. Note that just these core moves are not the only tricks you can do; you can combine them however you want to create your own unique skill move. Please note that many of these skills can be done with either foot, so they have two versions, which are done using opposite sides on the analog stick. 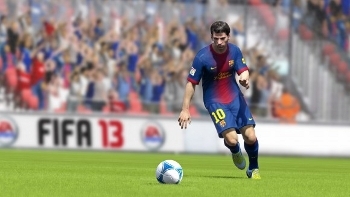 FIFA 13 features a new style of play in which it is much more difficult to pull off skill moves. Although skill moves have long been an important part of FIFA gameplay, in FIFA 13 you will need to practice these moves a lot in order to get good using them in a game situation. Bergkamp Flick Watch LT + Flick Right Stick D as ball is coming directly toward player. Reverse Toe Bounce Watch While juggling, hold Right Stick L.
LATW Watch While juggling, Right Stick D, clockwise twice fast. Reverse Elastico Temporarily Unavailable While moving, LT + Right Stick down and over from L to R.